The Atomic Aquatics Foot Fin are the full foot version of the incredibly popular open heel Atomic SplitFin and has all of the same features in a lighter format. Atomic use a number of design techniques to mimic 'Natures Wings' including the main reinforcement side bars which control storage and release of energy, semi rigid panels to control the flex and shape of the blade, flexible joints between the panels to allow rapid reponse to kicking movements and the split blade itself that cuts through the water to create lift and thrust which is what propels the diver forward much more efficiently than a standard blade. The significantly lighter design means these split fins are ideal for the travelling diver that needs a less cumbersome fin but doesn't want to compromise of performance. The foot pocket has been positioned to reduce stress and discomfort on the foot and ankle and has been carefully finished to remove abrasive edges and points. Very nice fins. Good looking, comfy, light, agile and crucially (for me and my neoprene allergy) full foot. 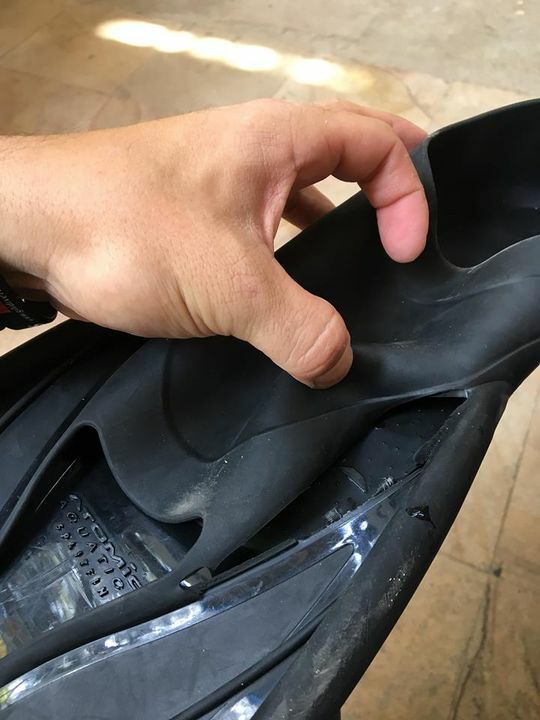 Lasted about 30-40 dives before the rubber joining the foot to the plastic of the fin ruptured. And that was on both fins. Disappointing, because up until then, I absolutely loved them. Really nice on a dive, very efficient almost feel like free diving fins although they are much more agile. Love how light they are compared to the non full foot version. the foot pocket is very comfy althoug I had to go down a size compared to my normal shoes. would definitely recommend buying.